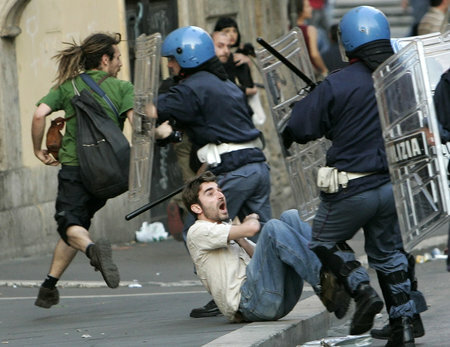 Protesters taking part in a demonstration in London’s Parliament Square were caught in violent brawls with the Metropolitan Police as United States President George W. Bush was making his way to meet Britain’s Prime Minister Gordon Brown at Downing Street on Sunday evening. The protest, called for by the Stop the War Coalition, the Campaign for Nuclear Disarmament and the British Muslim Initiative, was attended by 2000 people according to Scotland Yard, and had previously been banned from marching past Downing Street. As they approached the barrier police had erected to block off access to Whitehall, police officers defended the blockade wielding batons and arresting 25 protesters. While Deputy assistant commissioner to the Metropolitan Police Service, Chris Allison, criticized the protests as “deplorable” acts that could not “be described as lawful demonstration”, a Stop the War Coalition member put the blame on the police, stating that there would have been no violence at all had the demonstration be allowed to pass by the Prime Minister’s residence. An earlier demonstration near Windsor Castle, where President Bush met with Queen Elizabeth for afternoon tea, stayed peaceful. On Monday, Bush will join Gordon Brown in talks with Peter Robinson, the first minister of Northern Ireland, in Belfast, where further protests are announced. A Royal Navy pilot has safely ejected from his Harrier GR7 aircraft moments before it crashed in a field near the small village of Ashwell in England. The crash occurred at about 1350 BST today. The pilot was taken by air ambulance to Queen’s Medical Centre in Nottingham for treatment for spinal injuries. The plane, from the nearby RAF Cottesmore airbase, was on a training mission and is said not to have been carrying any weapons. Western Australian Premier Alan Carpenter made a two-minute broadcast on all televisions and radio stations over the gas crisis. The crisis began after a major fire at the Vanarus Island refinery operated by Apache Corporation reduced the available natural gas by 30%. Western Power today released figures showing that the power consumption has reduced since the crisis started. They said that the daily usage reduction of 40-50 megawatts was a moderate saving, that consumers could do much more. Australian economic growth forecast for 2008/09 has been reduced to 2.75% as the impact of the gas crisis ripples through the economy. Federal Resources Minister Martin Ferguson said today that disruption to economic activity is expected as Western Australian companies layoff thousands of workers with mining and industrial companies forced to cut back production. BHP Billiton has brought forward upgrades to its nickel refinery in Kambalda and diverted its gas allocation to keeping the Worsley Alumina refinery operating. The upgrade originally scheduled for mid 2009 is expect to take four months to complete. BHP has said that it will continue to accept ore from independent mining operators in the area inline with current contracts. Economists expect continuing turbulence as mining companies come under pressure to continue to supply China’s demand for materials from Western Australia, combined with growing inflation rising gold and commodity prices. U.S. President George W. Bush and British Prime Minister Gordon Brown have promised new sanctions on Iran if the Gulf country continues to enrich weapons-grade uranium. At a joint press conference in London today, Brown announced that “today we will urge Europe – and Europe will agree – to take further sanctions against Iran.” Britain is pressuring the European Union to freeze the overseas assets of Iran’s Bank Melli, which the United States accuses of supporting Iran’s missile programs. European Union spokesperson Cristina Gallach says that Europe is prepared to take action. In response to the announcement, Iran has withdrawn approximately $75 billion of its European foreign assets. “Part of Iran’s assets in European banks have been converted to gold and shares” said Iranian deputy foreign minister Mohsen Talaie, “and another part has been transferred to Asian banks.” The Iranian government gauges its foreign exchange reserves at $80 billion. Environmental activist and former Vice-President Al Gore today announced his support for Democratic candidate Barack Obama in the United States presidential election. In an email sent to Obama supporters, Al Gore voices his support for the presumptive nominee. “From now through Election Day,” he writes, “I intend to do whatever I can to make sure he is elected President of the United States.” He believes that Obama is the candidate who will “bring change to America” in issues such as the Iraq War, the American economy, and climate change. At the rally in Detroit’s Joe Louis Arena, Gore called Obama “the next President of the United States of America” and said he could lead the nation past “eight years in which our Constitution has been dishonored and disrespected”. He addressed the issue of climate change, which he said many Republicans had “refused to discuss at all”. “The outcome of this election will affect the future of our entire planet,” Gore said, adding that “the future is ours, not to predict, but to create.” He compared the criticisms of Obama’s young age and foreign policy experience to those faced by John F. Kennedy in the 1960 Presidential election. Obama spoke next, thanking Al Gore and calling him “a global leader in the fight for a clean energy future”. He discussed many issues, including healthcare, education, the national debt, and the war in Iraq. 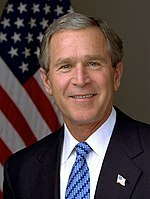 He criticized the way the Bush administration has handled these issues, and repeated the oft-heard criticism that McCain is running for Bush’s “third term”. “We can’t afford 8 more years of George W. Bush policies,” Obama said. He said that if there was one thing that could unite the Democrats, it is that “when we go into the polling places in November, the name ‘George W. Bush’ will not be on the ballot.” Obama commended McCain for his service to the country, but said that he “seems to have lost his way” from his reputation as a political maverick. “The Straight Talk Express lost a couple of wheels,” he said. Obama thanked his supporters for helping his campaign, saying that “change in America doesn’t happen from the top down; it comes from the bottom up.” He also thanked former candidate Hillary Clinton, although many booed at the mention of her name. “She’s a fighter,” Obama said. “And we need fighters in the Democratic Party because we’ve got a lot to fight for.” Obama and Gore were introduced by Michigan governor Jennifer Granholm, who supported Clinton in the primaries but now says she is supporting Obama. 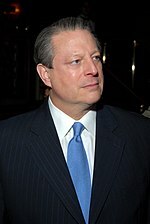 Al Gore served as Vice-President under President Bill Clinton in the ’90s, and after losing the 2000 Presidential election to George W. Bush, he focused his efforts on environmental activism, winning an Academy Award for his documentary An Inconvenient Truth. He has also won a Nobel Peace Prize for his efforts in teaching the public about climate change.